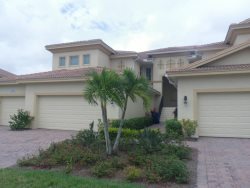 This "Cornell" model garden home is comfortably furnished and ready for you to enjoy the Florida lifestyle!! Take advantage of the great location that this garden home offers. This home has three bedrooms, two baths, living room, formal dining room, kitchen with a casual eating area, rear screened lanai, and one-car garage. The master bedroom has two walk-in closets, providing plenty of storage. The master bath has both a separate shower and garden tub as well as a double sink vanity. The beautiful furnishings and decor will make you feel right at home. The master bedroom, living room and lanai all offer terrific views. From your screened lanai you will be able to enjoy the lake view and Florida breezes while you relax and watch the golf course activity.